Home Tags Posts tagged with "3D Design"
As technology continues to revolutionize education, our educational systems have a considerable task at hand: preparing young learners to thrive in a technology-rich environment while helping them tackle complex environmental and societal issues. 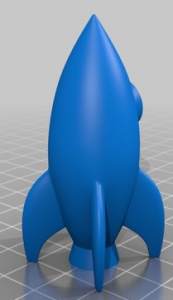 One way you can fuel student innovation with STEM learning is with TCEA’s 3D Design Contest. Instill a passion for STEM in your students as they develop and design an invention to solve a real-world problem. 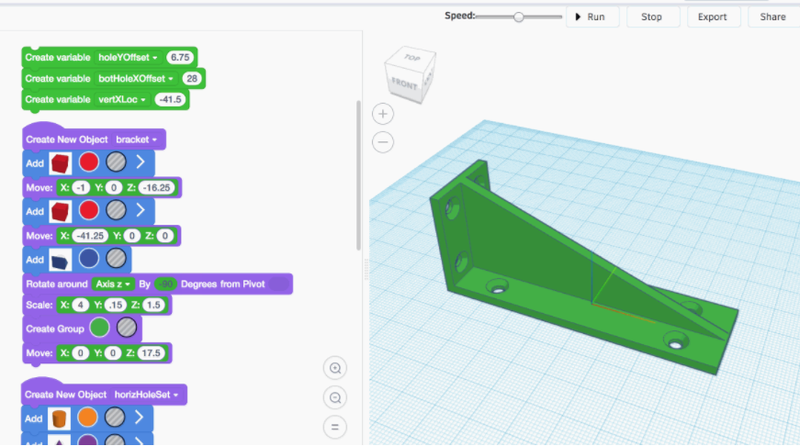 Your students’ mission, should they decide to accept it, is to create something using 3D design software to help meet a need or solve a problem associated with weather. Think about some of the problems weather causes, including but not limited to, extreme heat, drought, wildfires, flash floods, tornadoes, ice storms, etc. The contest is designed for secondary students. Students in grades 6-8 have the option of competing in either intermediate or advanced, while students in grades 9-12 may compete in advanced only. Each school/educational entity may submit only one team’s entry. A team must consist of one sponsor and up to four students. Note: students may only participate on one team. Contest work must take place between March 5 and March 30, 2018. For details and all contest rules, please visit the official contest page. A marketing plan presentation not to exceed one minute in length. Please note, a 3D printer is not required to enter the contest. 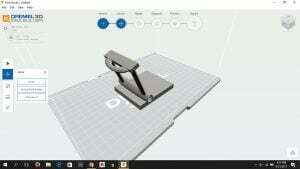 However, students will need access to 3D modeling software. Public schools can request a free copy of SketchUp Pro through TCEA, while private schools can purchase a discounted copy of the software. We hope you will consider participating in this year’s contest. Sign up before March 5 for only $50 per team. The top five winning designs will be announced in May. Winners will be awarded a trophy for their school and a medal for each team member. So what are you waiting for? Register your team today! The August issue of TCEA’s quarterly magazine TechEdge will be out very soon. The theme of the August issue is global connections. In each story, educators from around the country share how breaking down classroom walls and fostering global awareness and empathy are transforming their students. We wanted to include a sneak peak of one article from the very talented Tina Coffey on her work with the organization Level Up Village. This article is abridged, and the full version will appear in the magazine. 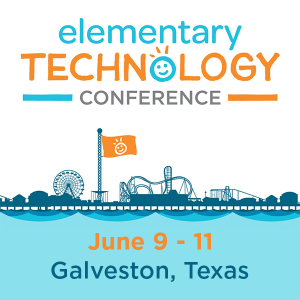 TechEdge is sent to all TCEA members. If you are not a member, it is not too late to join here. You’ll receive the next issue in the mail and have access to a digital archive of past issues. One Friday morning in March, I walked into a fifth grade classroom to a buzz of activity. Small groups of students were gathered around an iPad practicing beginning Spanish words. Others were working feverishly with students from the local high school to customize and practice Spanish phrases. One student was showing the teacher a video he had recently received from his Nicaraguan teammate. Throughout the room, the excited chatter of students filled the air. I was delighted to see so much focused activity. This group was a completely different Global Studies class than the one I had seen two months before. But what had caused this transformation? A former colleague introduced me to a company that was able to provide our district a great solution. Level Up Village offers global STEAM classes for grades K-9. Their courses include everything from Global Web Designers to Global Storybook Engineers. For each course, classrooms in the United States are partnered with classrooms in developing countries. Together they complete a STEAM project, while also getting to know about a different country in a very personal way. Level Up Village takes care of all the logistics, including pairing students with individual global partners, providing fully developed curriculum and teacher training, and facilitating global communication and collaboration via a safe and secure portal. After conferring with our central office staff, our district began piloting a Level Up Village Course called Global Inventors, which focuses on 3D printing. Up until this point, Global Studies was usually taught in fifth grade along with writing, and was mainly focused on textbooks and internet research. We planned on capitalizing on the Global Inventors course’s cross-curricular components to integrate lessons that met science and math standards alongside Global Studies. We approached a teacher at Oak Grove Elementary who was enthusiastic about piloting the eight-week program. All students in fifth grade at Oak Grove were able to participate, and each one was paired with a child from Argentina, Nicaragua, or Honduras. As part of the course, each student sent video messages back and forth to his or her partner. Often the video topics were prompted by a few suggested questions, but students were free to come up with their own as well. This exchange of videos soon fostered a friendship across countries that made the project real and meaningful. Level Up Village provided a series of videos that challenged students to look beyond simple similarities and differences and delve into complex problems. One issue they looked at centered on electricity production, usage, and accessibility. The students learned surprising facts, such as that Nicaragua has a lot of untapped potential for geothermal energy production thanks to its nearby volcanoes. They also learned that not everyone has easy and cheap access to electricity. 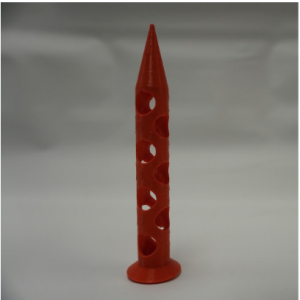 This knowledge helped set the framework for the purpose behind the 3D design project. 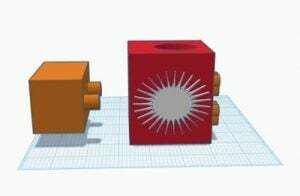 To create their global inventions, students used a computer-aided design (CAD) software called Tinkercad to design a casing for a solar flashlight, which was then printed on the 3D printer. Solar flashlights were novel gadgets for our students, but for their partners in developing countries, these flashlights could be used when electricity was not available. Students had to call on their understanding of circuits, measurement, and 3D calculation to design the flashlights. They had to make sure the case they designed could both contain the required electrical components and fit on the class 3D printer. 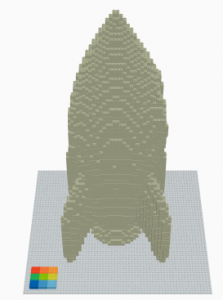 Using Tinkercad was by far the hardest part of the course for many of these students. However, knowing they had a partner that was counting on them helped them persevere. Throughout the Global Inventors course, the students’ growth as global citizens was evident. They could not only name basic facts about the countries they studied, but understood so much more. The project cultivated greater empathy, understanding, and curiosity. The students’ written reflections on their class blogs reflected their growth as citizens of the modern world. Making a Difference with LUV from elemitrt on Vimeo. If you are interested in trying the Global Inventors course in your school, the In School Price is $55 per student. However, some district-wide variations apply. Level Up Village also says that a number of schools have successfully applied for grants from community organizations to run their courses. The writer of this guest blog, Tina Coffey, is the Instructional Technology Resource Teacher at Oak Grove Elementary School in Roanoke, Virginia. She is also the Level Up Village US Teacher of the Year for 2017. Connect with her on Twitter @elemitrt. 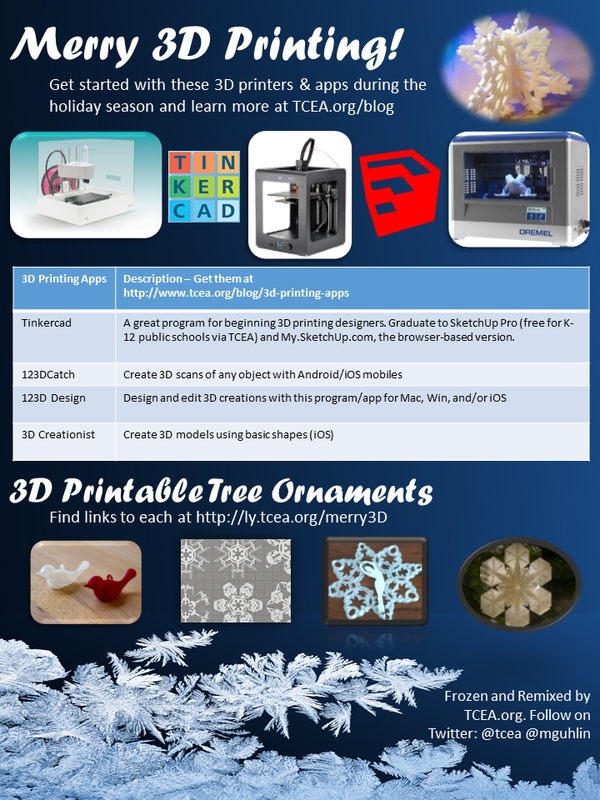 Last week, TCEA announced our first 3D Design Contest winners. During the contest, the students worked together in teams of four with the help of an adult sponsor. 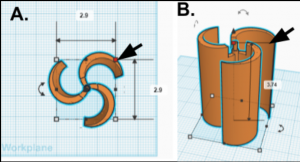 They were tasked with coming up with a solution to a real-world problem by designing a product with 3D design software. Each team kept careful track of their thinking as they followed the steps of the Engineering Design Process from researching and brainstorming solutions to testing a prototype and refining their design. 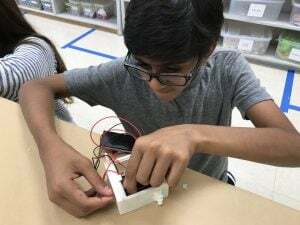 We were amazed by the creativity of this year’s entries and want to share with our readers a little taste of what students can accomplish when they’re given the freedom to engineer and create. Here are the top five 3D Design Contest winners and a little about their projects. The winning team was from Archer City ISD, and Mika Morgan was their team sponsor. This group wanted to solve a problem that affects millions of people around the world. Through their research they discovered that in many parts of the world, people who struggle with vision impairment don’t have access to corrective lenses. Untreated vision problems can lead to more severe issues and even blindness. 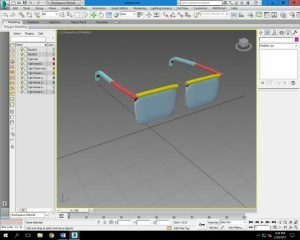 Their solution was to design inexpensive glasses frames that can be 3D printed on site. They called their product Vivamus from the Latin for “let us live.” The students designed the frames and carefully calculated the cost to print each one. 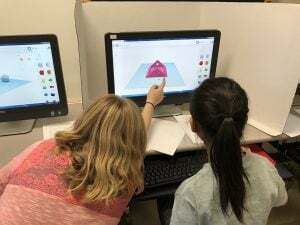 In the end, the product they created wasn’t just a lesson in using 3D software, but in collaboration, problem-solving, and engineering thinking. The second place team from Burkburnett ISD was overseen by sponsor Glenda Moore. These students sought to help people who suffer from mobility issues and have difficulty getting in and out of chairs. The inspiration for the project was one of the team member’s grandmothers. 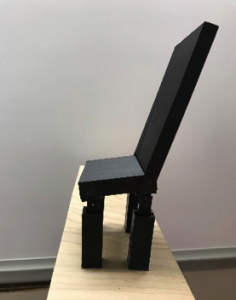 They designed a chair, fittingly called the EZ – Stand, that could swivel up and down from the back legs to help a person to stand up out of it. In making their project, the students considered all of the needs of their potential user, including comfort and appearance, as well as basic utility. What problem is more universal than worrying about banging your thumb when trying to hammer a nail into a piece of wood? The third place team was from Brady ISD and led by Teresa Smith. They wanted to create a tool that would protect the fingers of craftsmen, carpenters, and DIYers everywhere. They had a number of ideas. Some of them didn’t pan out as they’d hoped. But they kept going back to the drawing board and refining their vision. Finally, they created a plier-like tool they called the N.W.A. (Nail Without Agony). They then created a plan to market their product in hardware and general stores. The team from Beaumont ISD, led by sponsor Joy Schwartz, wanted to bring more beauty to people’s everyday lives. They thought about something many people see and use regularly: their phone and its protective case. They wanted to find a way to make phone cases more beautiful and also more customizable to each individual’s artistic preferences. Enter: the ArtCase. This is a 3D-printed phone case with a main body and eight customizable panes. These panes are a chance for an individual to add their own unique artistic expression into their phone case. Fifth Place: Changing Jordan’s Life in a Click! When students from London ISD, in a team led by Holli Horton, started thinking about a problem they wanted to solve, they chose to focus on helping a member of their own community. Jordan is a student who uses a wheelchair and has mobility issues that limit his hand movements. The problem he faced is that he was unable to buckle his seat belt without assistance. The students decided to design a tool that would help Jordan to do this specific task. In turn, this would provide him greater freedom and self-reliance. Their solution could also have a larger impact for people who have mobility issues similar to Jordan’s. But in the meantime, the team made a task easier for at least one person in their community. All of these incredible winners received trophies for their school, along with individual medals. However, these are only a few of the amazing creations submitted. TCEA congratulates all of the entrants of the 3D Design Contest for their hard work and incredible results. They are to be commended for their insight in identifying a problem and the strong critical thinking, collaboration, and creativity they displayed in solving it. 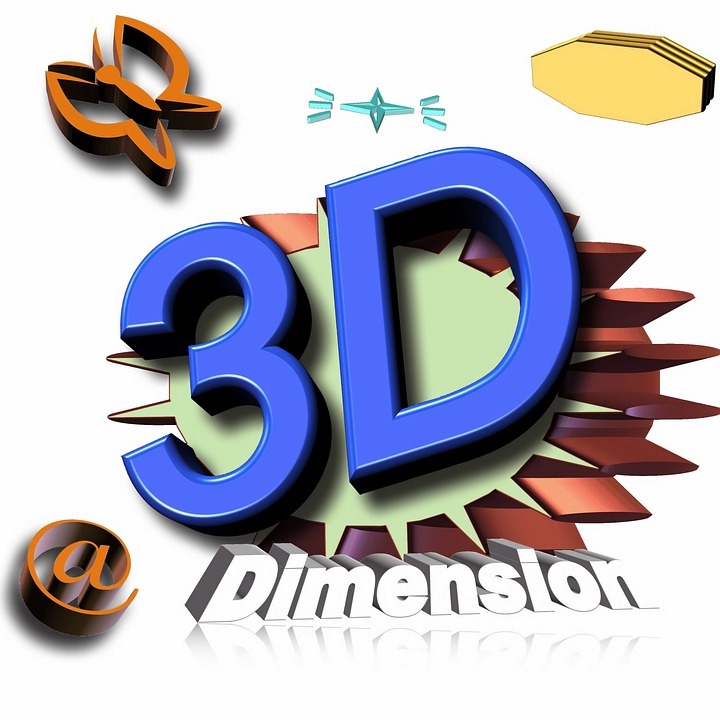 For more information about the 3D Design Contest, please see this website. In its inaugural year, the competition was open to high school students, but we plan to open the field to more grades in subsequent years. We hope you will enter a team, and we look forward to seeing your team on this list next year! 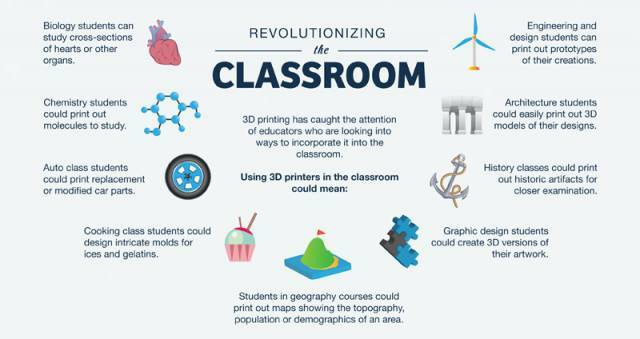 Are you preparing your students to enter the world with knowledge and skills in 3D technology? It is used in so many industries and jobs: architecture, gaming, science, medicine, entertainment, publishing, and advertising, and marketing. By adding 3D modeling software to your curriculum, you are bringing real-life tools to your students. 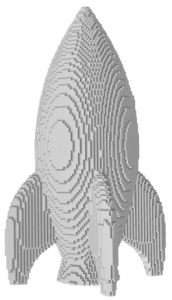 Access to 3D software might just inspire your students to pursue STEM careers and get a headstart on a future career. 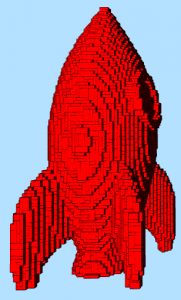 You may be thinking that 3D design software is expensive and out of your reach. We’re happy to say that’s not true. TCEA can provide you with SketchUp Pro, a powerful 3D modeling software package, for FREE. Through our exclusive partnership with Trimble, we are able to offer every K-12 public school in Texas free licenses of the program on each school-owned computer. You do not need to be a member of TCEA to take advantage of this opportunity. Trimble and TCEA want every public school to have this resource. Many districts have already received their licenses and are on their way to giving their students this incredible resource. Sign up here to receive your licenses. 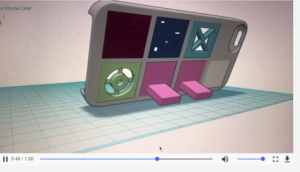 How Are Teachers Using SketchUp Pro? Charlie Parker, Robotics Teacher and Coach at Wedgewood Middle School in Fort Worth ISD, is using SketchUp Pro with his robotics teams. Last year, the teams used the software to design parts for their robot and then 3D printed them to use in competition. Chad Wilson from San Antonio ISD uses SketchUp Pro to prototype Vex and Lego robotic build designs. He says teaching his students an industry standard resource that is readily accessible is priceless. Thomas Alberts from Jacksonville ISD says that teaching students to use Computer-Aided Design (CAD) programs such as SketchUp Pro gives them another tool they can put on their resume. He advises those new to SketchUp Pro to watch a few of the free introductory videos and then just start building. Greg Morris, AST/Agricultural Mechanics teacher at Giddings ISD, is using SketchUp Pro for both current shop projects and those still in the planning stages. Chantelle Dallas, Math Teacher at Harmony Science Academy in Dallas, says her 6-8th grade computer science classes are using SketchUp Pro to design a STEM project, which is helping them to think critically and logically. They are able to see how 3D images work and are better able to visualize how their projects look. She went on to say that word spread around the middle school about her class designing a 3D project, and she’s now having more students join the Gaming and Computer App Club. It’s easy. Just click here to sign up. We’ll email the licenses within 48 hours. Access installation and online help are available here. TCEA offers a webinar on how to use the software in the fall and spring each year. Fall dates are still to be determined. As soon as it’s on the calendar, we’ll send you an email inviting you to the webinar. You’ll be able to watch the webinar live or receive the link and watch it at your convenience. Be sure to take advantage of this incredible, free resource today. The time your students spend learning and using SketchUp Pro might just inspire and bridge them into their future career.